By analyzing the COSMOS field, the largest field of galaxies ever observed with the Hubble space telescope, an international team of scientists led by researchers from the California Institute of Technology (United States) and researchers from the associated laboratories of the CNRS and the CEA , made the first three-dimensional map of dark matter in the Universe using gravitational lensing effects. This historic first seems to confirm the standard theories on the formation of the large structures of the Universe. This study was presented in the January 7, 2007 issue of the journal "Nature." For astronomers, mapping the distribution of the mass in the Universe from its light component is a considerable challenge. It is an exercise as complicated as determining the extent of a city solely from aerial photographs taken at night. Luminous matter (stars, galaxies, ionized gas) represents only about one sixth of the total matter of the Universe. The remainder is invisible and composed in particular of the mysterious component called dark matter. 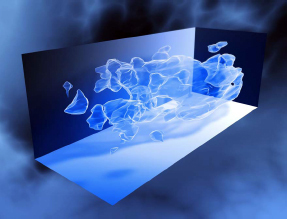 Nonetheless, despite the complexity of the task, a three-dimensional map of all of the mass, luminous and dark matter was made for the first time in the COSMOS field. An international team of astronomers achieved this feat by using the gravitational lens effect to measure the large-scale distribution of matter. This new map brings more information comparable to what we would have by seeing a city in daylight rather than at night to be able to distinguish all of the fine details. The map of dark matter was made by measuring the shapes of half a million distant galaxies. To reach us, their light had to cross the "fields" of dark matter and the beams of light were slightly deflected. This phenomenon is a direct consequence of Albert Einstein's theory of general relativity which predicts that the presence of a large mass locally distorts Space-Time. In consequence, the trajectory of particles passing close to this concentration of mass is diverted. Photons, particles associated with electromagnetic radiation, are not an exception. The deformation observed in the shapes of the galaxies was used to reconstruct the distribution of the mass along the line of sight. The COSMOS field covers a region of the sky nine times the size of the Moon (1.6 square degrees). The COSMOS survey done by Hubble includes 575 images from the ACS camera (Advanced Camera for Surveys), corresponding to close to 1,000 hours of observation. Following the observations made with Hubble, many additional observations with telescopes (like the Subaru, the VLT and the CFHT) and in space (XMM-Newton) on the ground were carried out. In particular, the multi-color images from the Subaru and the Canada-France-Hawaii Telescopes, as well as the thousands of VLT spectra measured with the VIMOS instrument allowed for estimation of the distance of the various structures, thereby enabling this 3 dimensional map to be made. It shows that luminous matter concentrates along the densest regions of the dark matter and a network of filaments that intersect where clusters of galaxies are located. Furthermore, the map covers close to half of the age of the Universe and makes it possible to monitor the evolution of the distribution of dark matter, as it becomes more and more structured over time. "Mapping the distribution of dark matter in space and time is fundamental for understanding how the galaxies developed and grouped themselves over time. The results obtained through the COSMOS survey seem to be in accordance with the standard theories of the formation of the large-scale structures of the Universe," says Jean Paul Kneib, CNRS researcher at the Marseilles Laboratory of Astrophysics. 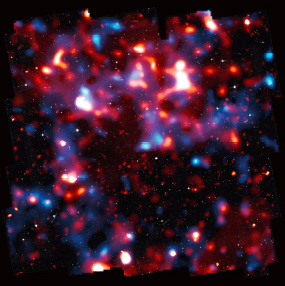 The COSMOS survey thus brings us a three-dimensional map of the dark matter in the Universe and will allow us for the first time to monitor the relationship between the distribution of dark matter and the formation and evolution of galaxies. This type of mapping of the Universe by the weak gravitational lens effect is already orienting future space missions that are now already underway... We can thus imagine that in the decades to come the whole Universe could be mapped, in an even more detailed manner, perhaps making it possible to shed light on the existence and the nature of dark energy, the elusive force which is thought to be accelerating the expansion of the Universe. Written from a news release by CNRS.